There are few vagrants recorded in Britain that utterly stun you. Of course, a great many rare waifs have the ability to excite and animate birders, particularly the rarer and more attractive individuals, but barely any are capable of totally knocking the stuffing out of you instantaneously. It’s fair to say that’s what happened to more or less every birder when they heard Sunday evening’s news from North Ronaldsay – an adult male Siberian Blue Robin had been found on the island. Whether the news made you choke on your Sunday roast, utter obscenities in all-too-public places or simply sink in to your chair, eyes popping, it was difficult to take in. Siberian Blue Robin, one of the rarest Far Eastern vagrants to reach our shores, and a sparkling adult male at that – it simply didn’t sound possible. Then photos started to appear. The reaction across social media was a mixture of disbelief and crippling jealousy. How could such a perfect bird have made it here, as a vagrant? It seemed too good to be true. Was it a joke? No, it couldn’t be – look at all those photos of it, framed against an instantly identifiable North Ronaldsay wall! Siberian Blue Robin, North Ronaldsay, Orkney (George Gay). The three previous British records (one of which was on North Ronaldsay on 2 October 2001) were all brown first-winters. 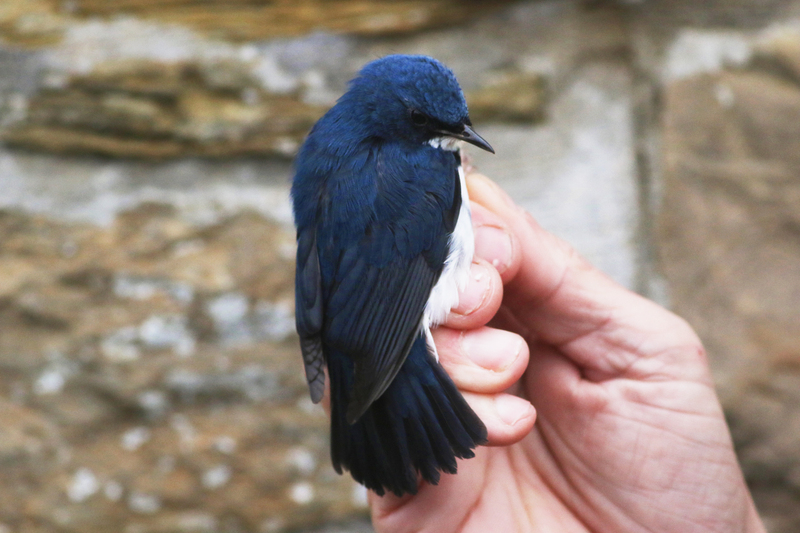 Each of those, in their relatively drab cloaks of immaturity, had caused enough hysteria when news broke (although the Foula bird of 2011 was found dead), but this blue-and-white beauty took the state of panic to another level. Unfortunately, as with the previous three (and a fourth record from the Channel Islands), this male proved a one-day wonder and had long since disappeared by the morning of 9th. Cue disappointment (and some relief) among twitchers on standby, for this elusive Larvivora had once again out-foxed the vast majority of the British birding scene. One day, there will be a twitchable Siberian Blue Robin in Britain – but will it look quite as swashbucklingly sensational as the North Ronaldsay bird of 8 October 2017? Somehow that seems unlikely … meanwhile, on North Ronaldsay, a handful of fortunate souls had just enjoyed one of those great birding experiences that live with you for the rest of your life. Even before the interruption of the robin, it had proved a fairly busy early October week. 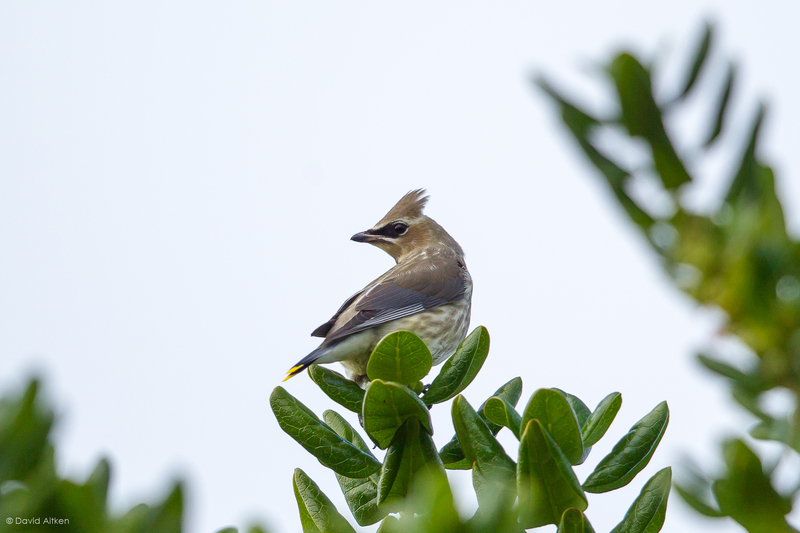 Scilly’s Cedar Waxwing put on a fine show, lingering for a total of seven days and last being seen on 9th. During this time it became increasingly confiding as it settled at St Warna’s Cove, on the south-west side of St Agnes, gobbling up a multitude of Pittosporum berries and allowing a large number of birders to connect from the mainland. Cedar Waxwing, St Agnes, Scilly (David Aitken). 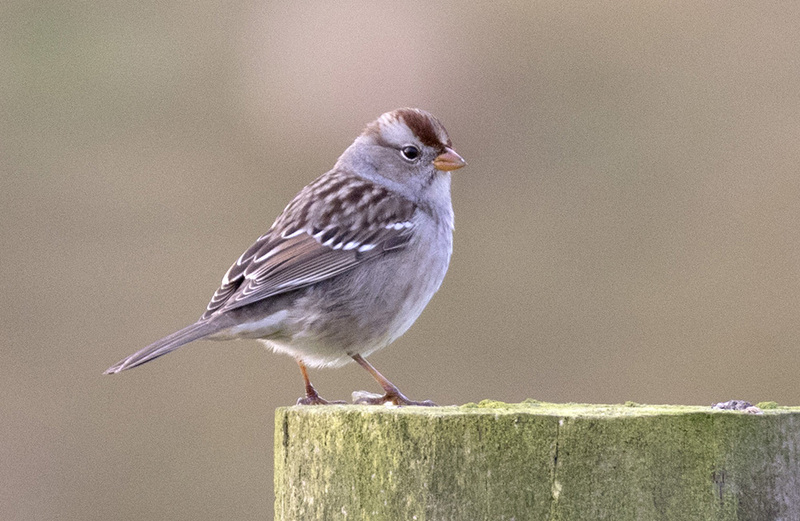 Far to the north of Scilly, the Shetland island of Foula scored heavily on 8th with a first-winter White-crowned Sparrow. It should not be overlooked that this is an extremely rare bird on this side of the Atlantic and a find of the highest order, with just five or six individuals having previously occurred in Britain (and one in Ireland). Of course, many will have seen the famous Cley bird of 2008, but first-winters are so strikingly different in plumage, and arguably better looking than their mature congeners, that seeing a youngster must almost feel like seeing a different species. Lingering to 10th, it’s only the second to be seen in Britain in this plumage, following one at Seaforth for a day in 1995. Incidentally, it appears that it may well have been the same bird as that seen in the Faroe Islands the previous day (more on that below). White-crowned Sparrow, Foula, Shetland (Roger Riddington). Further Nearctic delights included the first Blackpoll Warbler of the autumn at Blacksod, Co Mayo, on 7-8th, the Scarlet Tanager still at Mizen Head, Co Cork, to 6th and no fewer than five Red-eyed Vireos, four of which were in Ireland (Cos Cork (2), Galway and Kerry) and the fifth an excellent occurrence at Deerness, Orkney, on 8th. An American Buff-bellied Pipit showed well at Grutness, Shetland, from 4-6th while the American Cliff Swallow on St Mary’s, Scilly, was last seen on 6th – presumably the same bird was briefly over Porthgwarra, Cornwall, on the morning of 7th. Scarlet Tanager, Mizen Head, Co Cork (Norma Gleeson). 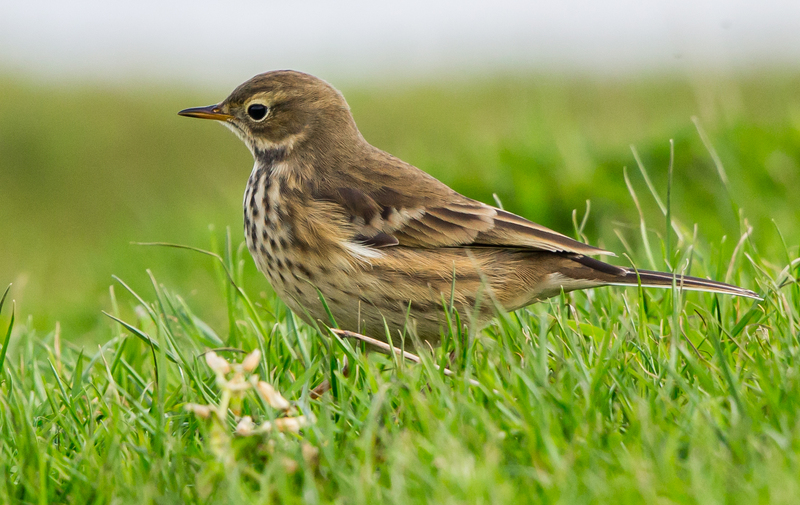 American Buff-bellied Pipit, Grutness, Shetland (Peter Garrity). 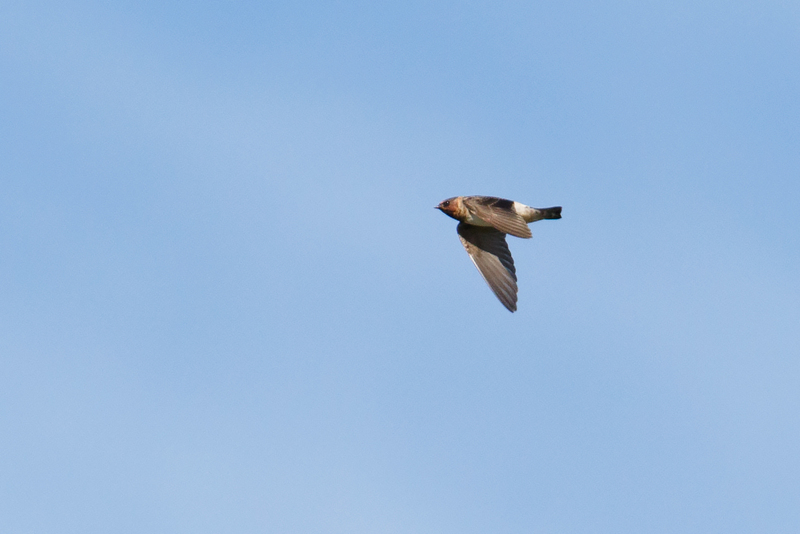 American Cliff Swallow, St Mary's, Scilly (Josh Jones). Another recent highlight, the Eurasian Scops Owl continued to appear at its day roost at Ryhope, Co Durham, to 5th, although major rarities were otherwise in short supply on the mainland. The Isabelline Wheatear continued to show well on St Mary's, Scilly, throughout. 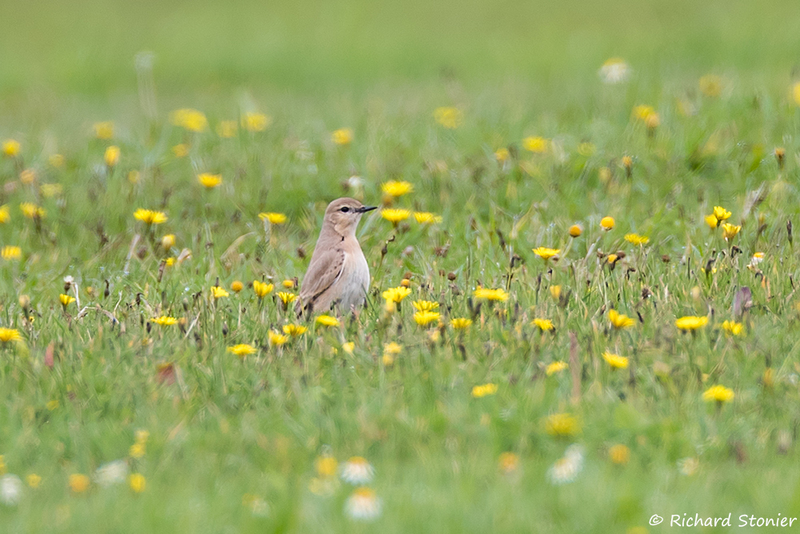 Isabelline Wheatear, St Mary's, Scilly (Richard Stonier). Shetland produced two Siberian Rubythroats this week, although neither was in any way accessible. A female was glimpsed a few times on Bressay on 5th (but had gone by the following morning) and a male was reportedly photographed at North Roe on 9th, though with news only filtered out the following day. Fair Isle scored a White’s Thrush on 7th. Rarity-wise, the archipelago also produced a Rustic Bunting at Cunningsburgh, lingering Red-throated Pipits on Unst and Fair Isle, Siberian Stonechat on Fair Isle, Booted Warbler on Bressay and an elusive Thrush Nightingale at Sandgarth from 8th. 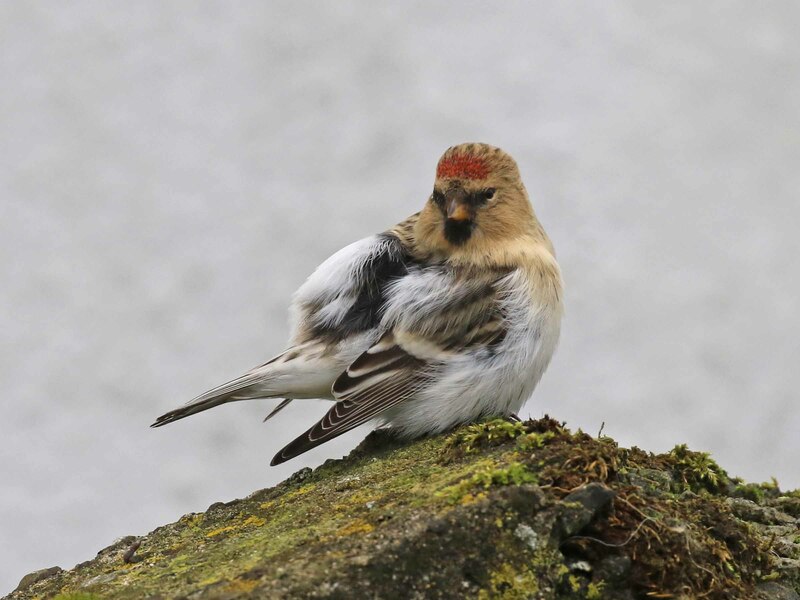 As well as these, a mini-influx of Hornemann’s Arctic Redpolls occurred. Several were seen on Unst, including a peak count of three together at Baltasound on 7th and at least two in the Norwick area. One showed well at Ollaberry, Mainland, from 6-8th and a further bird was on Foula on 7th. Just to confuse matters, there was also a small arrival of Coues’s Arctic Redpolls, with at least two seen on Unst. Hornemann's Arctic Redpoll, Skaw, Unst, Shetland (G W Petrie). 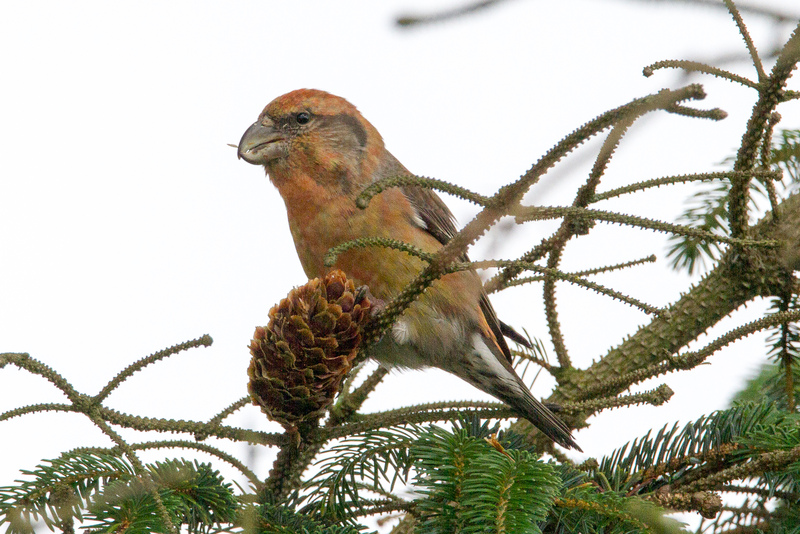 Parrot Crossbills also continued to invade Shetland, with several seen around Lerwick throughout the week, four briefly at Levenwick and two at Hoswick on 6th, three at Cunningsburgh on 5th. Further north, two were at Kergord on 4th, two at Vidlin on 5th and one at Swining on 6th with several also on Unst. Given that birds are appearing in the Low Countries, records from the British east coast are surely not far away. Parrot Crossbill, Sound, Shetland (Mick Kemp). Three Radde’s Warblers were seen this week. Two on 10th included a bird trapped and ringed at Dunwich, Suffolk (and another in Wells Woods), while the third was at Dale of Walls, Shetland, on 8th. Dusky Warblers were restricted to the Northern Isles, with birds at Gulberwick, Shetland, and North Ronaldsay, Orkney. The only Arctic Warbler was a bird at Kilnsea, East Yorks, from 8-10th. Yellow-browed Warblers finally reached the English east coast in good numbers from Sunday, with sample counts including at least 12 at Spurn on 8th and a minimum of 16 at Flamborough Head on 9th. Blyth’s Reed Warblers have been quite scarce this autumn and so a bird at Sandside Bay, Orkney, on 4th was notable, with others on North Ronaldsay and at Sandwick, Shetland. Marsh Warblers were at Mizen Head, Co Cork, from 7th and Quendale, Shetland, on 10th, with a curious record of a singing male at Donna Nook, Lincs, on 4th. The Melodious Warbler remained on Skokholm, Pembs, to 8th while an Icterine Warbler was on St Mary’s, Scilly, on 9th. In addition to the aforementioned Red-throated Pipits on Shetland, an excellent Irish record concerned a lingering bird at Lissagriffin, Co Cork, on 10th. Richard’s Pipits remain scarce with records from Cornwall, Orkney, East Yorkshire and Norfolk, the latter county hosting the only lingering bird (at Thornham/Titchwell on 8-9th). Olive-backed Pipits were at Kilnsea and Easington, East Yorks, as well as Uyeasound, Unst, Foula and Wells Woods, Norfolk, the latter seen on 10th. Little Buntings were restricted to Shetland, where they made it in to double figures. The archipelago also boasted the vast majority of the week’s Common Rosefinches, although there were three in the Outer Hebrides and birds on Gugh and St Mary’s, Scilly. Red-breasted Flycatchers included a couple apiece in the Flamborough and Spurn area, as well as the usual smattering across Shetland. Bluethroats were on Unst and mainland Shetland while the majority of the week’s dozen or so Wrynecks were in south-west England. A Greater Short-toed Lark remained on North Ronaldsay and four Great Grey Shrikes, three Red-backed Shrikes, eight Rosy Starlings and 15 Barred Warblers were logged nationwide. 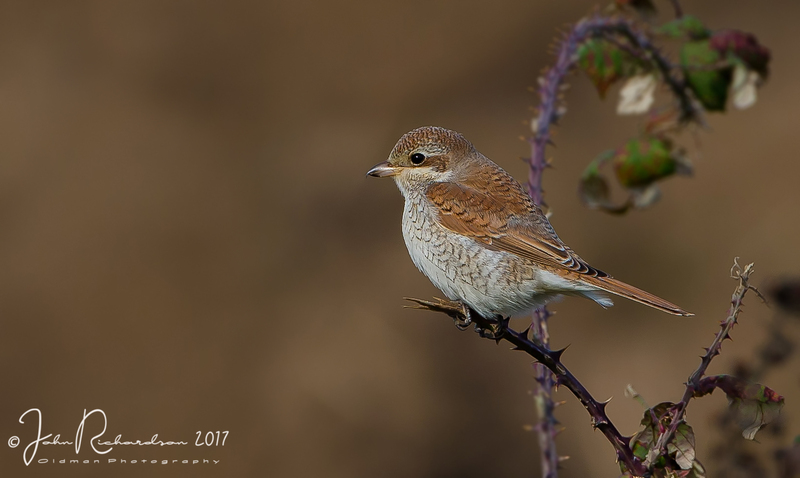 Red-backed Shrike, Boyton, Suffolk (John Richardson). The Wilson’s Phalarope/Long-billed Dowitcher combination remained on show at Oare Marshes, Kent, with further dowitchers including two juveniles together at Tacumshin, Co Wexford, from 6th, a juvenile at Crossens Outer Marsh, Lancs, from 9th and the long-staying Lincolnshire bird still in situ. Tacumshin also hosted one of the week’s three Lesser Yellowlegs (others were on Inishmore, Co Galway, and at Lodmoor, Dorset), one of three White-rumped Sandpipers. Single juvenile 'White-rumps' were also on North and South Uist. Buff-breasted Sandpipers were at Tacumshin on 7th and still at Davidstow Airfield, Cornwall, to 8th. Half a dozen Pectoral Sandpipers included inland birds in Suffolk and Gloucestershire, and Spotted Sandpipers remained in Cornwall and Gloucestershire. Ten American Golden Plovers included the confiding bird on St Mary’s, Scilly, and a new bird at Fingringhoe Wick, Essex, on 10th. 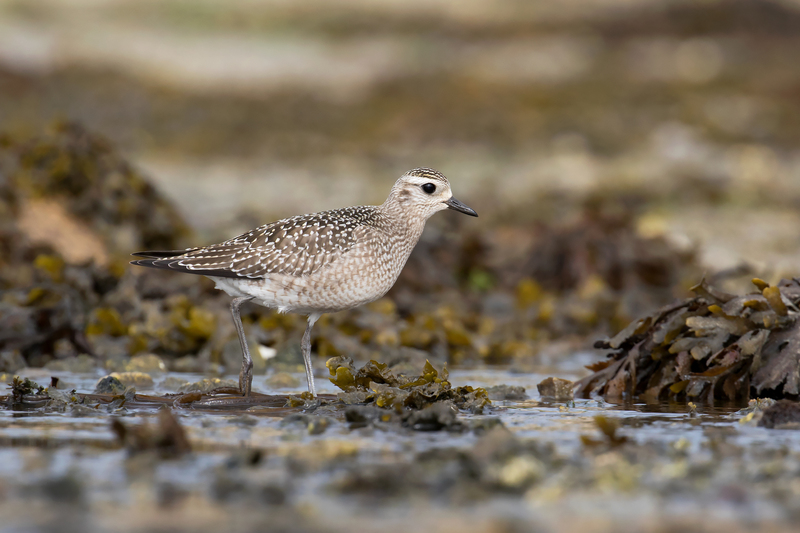 American Golden Plover, St Mary's, Scilly (Josh Jones). 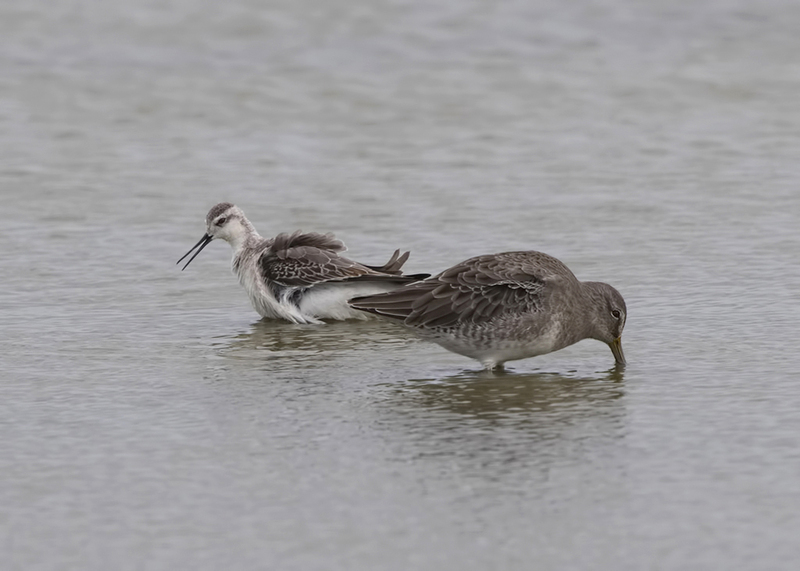 Wilson's Phalarope and Long-billed Dowitcher, Oare Marshes, Kent (Steve Ashton). Last week’s female Pallid Harrier was last noted at Burton Marsh, Cheshire, on 6th; the following day, a juvenile was found at Barrys Head, Co Cork, and it was still there on 9th. The Purple Heron remains a reliable fixture at Leighton Moss, Lancs, and was on show all week. Glossy Ibises were restricted to the south, with the most northerly being a juvenile at Kilbaha, Co Clare, from 7th. An amazing 32 Western Cattle Egrets roosted at Ham Wall, Somerset, on 10th; 17 at Hayle Estuary, Cornwall, on 4th suggested that more continued to arrive. An adult Demoiselle Crane over Burnham Overy, Norfolk, on 10th initially caused excitement. Although unringed, flight feathers on one wing were extensively damaged and suggested captive origin. 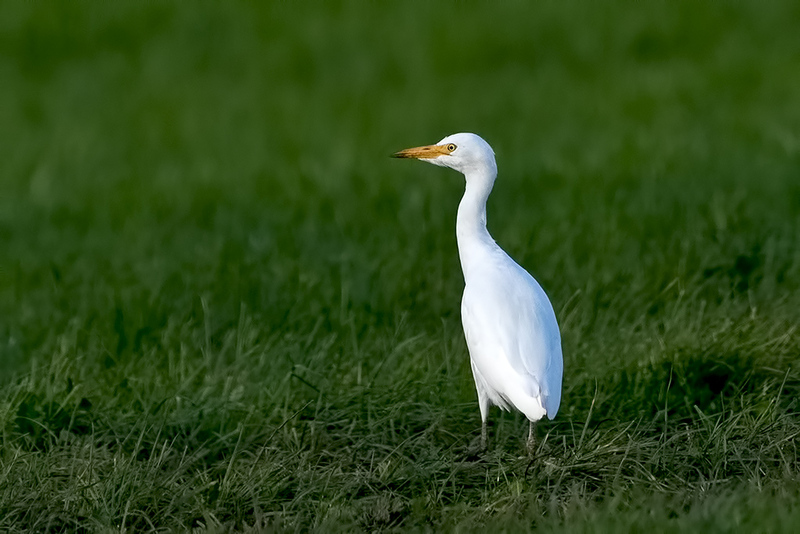 Western Cattle Egret, Alvecote Pools, Staffordshire (Derek Lees). Newly arrived Ring-necked Ducks were on Lewis, Tiree and Unst, up to two drake American Wigeon were at Rutland Water, with two more on North Uist and others in Argyll and Northumberland. Drake Surf Scoters were in the Sound of Taransay and off Lothian and Angus, and a female was in Ballinskelligs Bay, Co Kerry. Curious news of a Black-browed Albatross off Hundested, Denmark, on 5th raised questions as to whether the regular summering bird has even left the North Sea yet this autumn. While Shetland birders regaled in the discovery of a White-crowned Sparrow on Foula on 8th, what appears to have been the same bird spent the day at Vidareidi, Faroe Islands, on 7th. If undoubtedly the same bird then this is quite an amazing relocation. Laughing Gull and Red-eyed Vireo were both on offer in south-west Iceland this week, although the Great Knot reported at Höfn looks more likely to have been its commoner cousin [Red Knot] based on photos. Just the third Lanceolated Warbler for France was on Sein Island on 9th, and a Solitary Sandpiper was on Ile de Ré on 6th. It transpires from information read on a ring on its leg that the sub-adult Eastern Imperial Eagle in Overijssel, The Netherlands, now twitchable, is in fact the imperial eagle seen in Tuscany, Italy last winter – where it was identified as an immature Spanish. Azores news concerned the long-staying Redhead on Terceira as well as a Belted Kingfisher and two Solitary Sandpipers on Flores. 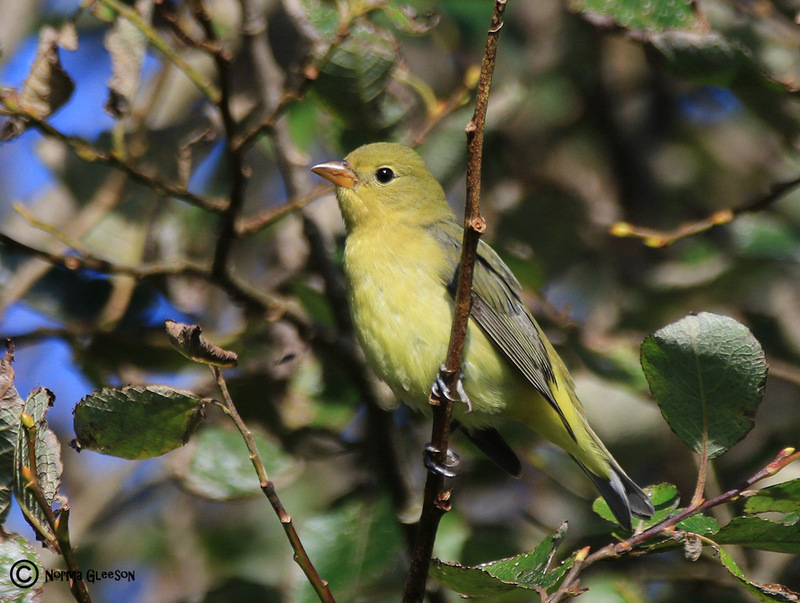 Nearctic landbirds on Corvo included Philadelphia Vireo, Yellow-billed Cuckoo, Ovenbird, Scarlet Tanager and Bobolink, but in an island context all of these were eclipsed by the Pied Flycatcher on 10th, a true Azores mega. 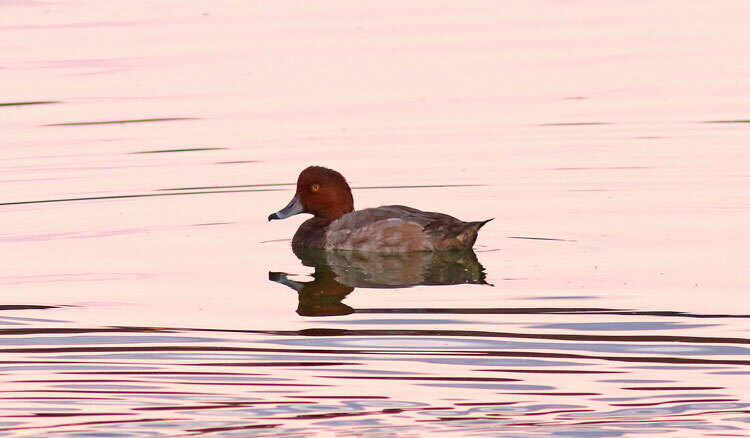 Redhead, Terceira, Azores (Peter Alfrey).